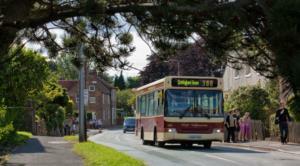 From Monday 6 July Beverley Town Service 521 will be extended to serve East Riding Community Hospital. There will be eight buses a day Monday to Friday, and nine on Saturday. The Service 521 times will change very slightly to help accommodate the new route. See the new Service 521 timetable. Any questions? Ring Busline on 01482 59 29 29, open Mon-Sat 8am-6pm.